I find working with our management teams to be profoundly satisfying. It's a great privilege to work directly with the team of people who built this business and who now hope to build it to double or triple its current size. And fast. 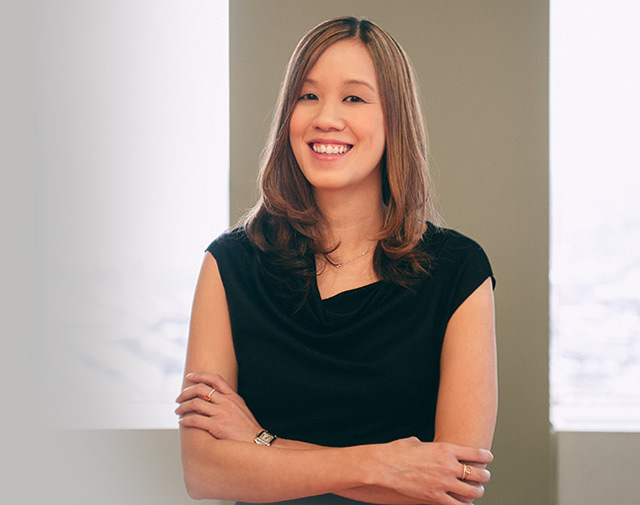 Christina Pai joined Fort Point Capital in 2011 as a Vice President and was promoted to Partner in 2015. Previously, Christina was a Principal at Swift River Investments where she was responsible for sourcing, analyzing and executing lower middle market buyouts, and served on the board of directors of several portfolio companies. Prior to joining Swift River Investments, Christina was an Associate at FdG Associates, a middle market private equity firm, where she participated in a number of platform investments and worked with portfolio companies to develop growth strategies and execute add-on acquisitions. Previously, she worked at JPMorgan Chase, focusing on mergers and acquisitions and corporate finance in the consumer products and healthcare sectors. Christina is a graduate of Dartmouth College. She enjoys all variety of travel and reading and is a Boston sports enthusiast. Describe your role and responsibilities at Fort Point Capital. I work on all aspects of the transaction process. I focus on sourcing new, interesting deal opportunities and on deal execution, including leading our due diligence effort, negotiations and financing process. After we close a transaction, I work closely with our management teams to set the strategic direction for each portfolio company, and then I work with each company's management team directly to drive the major initiatives expected to create the most value for all stakeholders. Two things. First, I love learning about different industries, companies and entrepreneurs and the history of their businesses. It's interesting to be in a position to perceive the commonalities of business opportunities across a spectrum of industries and companies. Second, and probably most important, I find working with our management teams to be profoundly satisfying. It's a great privilege to work directly with the team of people who built a great company and who now hope to double or triple its current size. And fast. I started my career as an investment banker. For me, the most interesting part wasn't necessarily financial modeling or even getting a deal done. The part of that job I enjoyed most was the challenge of learning about the company, the team and the strategy and then working together to position their business for sale in the best possible light. That's what led me to private equity. I was actually Fort Point Capital’s first employee. So really, what they gave me was an incredible opportunity to get into a private equity firm on the ground floor. From day one, I could apply the skills I'd previously acquired to help them build a team, a real sense of culture and ultimately a leading middle market private equity firm. Watching us go from our initial rent-free space in our law firm to our current offices with the team of passionate experts we have in place, and fund that's growing and thriving ... what more could I have ever hoped for? How is Fort Point Capital different from other PE firms? I think Fort Point Capital demonstrates a real mastery of all the steps in a typical investment lifecycle. Some firms are good at sourcing deals and the process of execution, but they're not great at developing those investments or figuring out how to invest coherently across an entire portfolio. Others are good at the process and the investing but are less structured in their approach to partnering with the actual company after the transaction. Fort Point is, in my opinion, excellent across all the major principal investing disciplines that ultimately determine failure or success in the private equity world. In what ways does Fort Point Capital offer the management teams at its portfolio companies an experience or a partnership that is unique or somehow better? I was just talking to one of our CEOs (at a Fort Point Capital portfolio company) about this. He said, "I felt like I was working by myself for 12 years. It finally feels like I have a real partner now." That's the one thing I've noticed in all of our relationships. The CEOs from our management teams will bring us their problems and their opportunities. And they do it because they believe we're here to help them. And we can help them. We really take the time to work with them—often, extensively. They trust us and know that we're willing and able to bring the kind of resources and expertise to bear it takes to break through whatever issue or opportunity they happen to be facing. To me, it speaks volumes about the mutual trust we have with our companies. What's the most important thing when it comes to making the private equity firm-management team relationship work? As I was just saying, trust. From my perspective, the management teams want to understand where we're coming from and what our expectations are—and they want to know we'll be consistent with those expectations. For us, we don't run the businesses per se. Certainly not day to day. So we need to build that trust with our management teams as a way to ensure they'll deliver on their promises—or, if unable to, that they'll come to us before the situation becomes critical. Because they trust us. And they know we'll work together to find the solution with them. And in my own experience, wherever there's success, trust is always a part of it. What advice would you give to an owner considering a private equity partner? Be open to the process. Be open to the private equity firm's perspective. Some management teams discount people who aren't from their own industry. Maybe they don't yet know the nuances driving the company's competitive position or the names of every piece of machinery, but most private equity firms have seen a breadth of companies across an enormous spectrum of industries, and that perspective can be truly invaluable. They've seen similar disruptions, patterns, innovation and the issues that your company might someday face. They also know how to develop a strategic plan while capitalizing on near-term opportunistic growth, which is of infinite value. Just try to stay open. And be sure that, through open and constant communication—and by working together in good faith—you build a strong and open relationship. That's the key. I always say, "I don't like secrets but, surprises, those I can deal with." Any interests outside of work? Travel. I absolutely love to travel. I inherited that from my grandfather, a physics professor. He used to take these fantastic sabbaticals and bring his whole family. They went all over the world. As a young girl, I remember asking, "How many countries have you been to?" We sat down and wrote a list together. Eighty-nine countries! That still amazes me. I aspire to match his total, but as I am currently somewhere in the '40s, I've got a few miles to go. I am also an aspiring chef, dedicated fantasy football contestant and Boston sports aficianado.